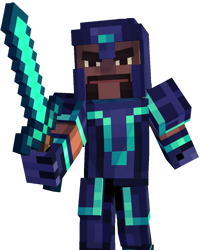 Ever since I left Radar behind at the end of s2e4 i expected him to return with the giant enderman in the finale and save us. But in order for this to happen you have to not only leave Radar behind, but you have to also choose to save Romeo. The result is one of the most badass scenes in the series where Radar and the enderman show up in the nick of time and the enderman teleports behind the admin monster and straight up breaks it's neck. Was definitely the "wow" moment of the finale for me. I thought it was interesting that in order to get this scene you have to make the tough decisions to a) leave a friend behind for the greater good and to b) refuse to leave an enemy behind. It is a testament to Jesse's character as well as Telltale's ability to tailor your story according to that character. I ended up liking MCSM a lot more than i expected to. It had powerful moments and endearing characters. Here's hoping Telltale gives us a definite answer about a s3 or at least a DLC that shows what happens based on your ending. Romeo didn’t have to stay altough he wanted to. I know, I meant that Jesse as a character is able to make noble sacrifices as well as selfless decisions. You can tell that Telltale wanted the player to let Radar save everyone as well as refuse to leave behind the Admin to die. I got this scene too in my playthrough and I have to agree with you The testament to your character thing is a cool thing to po… moreint out, but the circumstances under which we left Radar behind and took Romeo with us was different Radar wanted and needed to stay Romeo didn’t have to stay altough he wanted to.